This week we’re celebrating the wonderful combo of squash and grain zucchini bread. 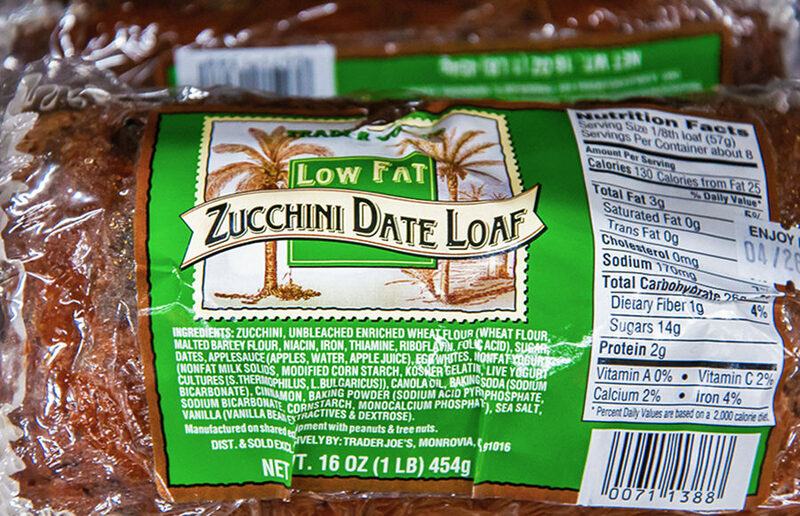 If you’re in the mood to join the festivities, we recommend you pick up a zucchini date loaf from Trader Joe’s. Sure, zucchini bread might not sound like the most delectable fare, but once you try it, you’ll never see zucchini the same way ever again. Zucchini bread was first brought to families in America around the end of the 19th century. So, we’ve had plenty of time to develop some taste for it. My conversation with a cashier best describes what is likely to be a common sentiment about zucchini bread. He told me that he was meaning to try the bread. I told him it’s really good. He was skeptical. … He proceeded to question if there were chunks of zucchini placed in the dessert. I couldn’t lie. There are chunks, but YOU CAN’T TASTE THEM! Zucchini on its own (raw) is already very flavorless, so imagine incorporating it with a ton of sugar and cinnamon. Hear me out. We must give zucchini bread a chance. There was a time in our lives when we thought banana bread was the best thing ever. Banana haters had a means to get their fill of potassium. Zucchini bread is no different. If you really wished to, you could think of a zucchini as a greener, less sweet alternative to a banana. Zucchini is chock-full of beneficial nutrients such as vitamin C, vitamin B6 and potassium (like its yellow counterpart). Zucchini is also a good source of fiber, so you won’t have to question whether or not a slice will clog the tracts. What we are trying to say is that if you like banana bread, you’ll probably enjoy the taste of zucchini bread too. Folks, zucchini bread is an opportunity. It’s an opportunity to incorporate vegetables into your diet (finally). On top of that, you’ll feel less guilty about eating the whole loaf at once. In fact, eating all the zucchini bread at once provides maximum health benefits (maybe). We’re surprised that it isn’t used in video games to “gain lives.” We must keep an open mind and consider all the uses for zucchini bread. For example, it could be used as a way to attract health nuts to a social gathering. Zucchini bread could also be used to win a baking competition as well as to patch up holes in walls. With experience, I have noticed that good zucchini bread is very tacky, so why not? If you really want to go all-out on the 25th, consider making some zucchini pasta to pair with some homemade zucchini bread. What better way to prepare for the summer than by basking in the glory of a true summer vegetable.